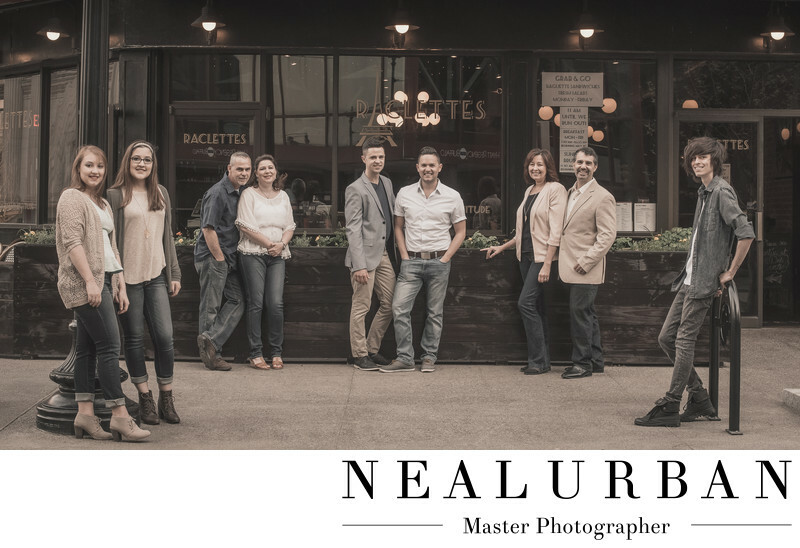 Danny contacted Neal Urban Studio for a fun family session. He did not want park style portraits. He wanted them done in downtown Buffalo. We thought it was a great idea! We began the session outside of Shea's Performing Arts on Main St. He mentioned he loved the Hotel at the Lafayette and wanted some photos there. Instead of all trying to park again, we decided to walk down. It was a beautiful evening. We would also be able to stop on the way for more photos! This restaurant front look pretty cool or this family. It is a french bistro called Raclettes on Main St. It was still early in the evening that there were not too many dinner guests yet. We had to move a few benches to get everyone in the shot. But, it came out so fun! We really liked the lights behind them in the restaurant. They created a really nice boca effect. We love when people contact us for different styles of photo sessions. The more different you give us, the more different images we can give you. Sometimes it's really hard to come up with new ideas if we are always going to the same locations. And we do not want people's photos to look the same. Location: 537 Main St, Buffalo, NY 14203.